Add the Meetcom RSS Feed. « How Many Types of Meetings? Did you get a chance to see the Microsoft keynote presentation at this year’s Consumer Electronics Show? If you didn’t yet, don’t bother. Steve Ballmer, CEO of Microsoft was making one of the most prominent keynote presentations of the year and he chooses to use a lame, over rehearsed sit-down interview format, rather than a powerful stand up and deliver, visually exciting, information packed, fast moving PowerPoint slide slide show on the future products of Microsoft – including the future direction of one of their anchor products Microsoft Office and . . . PowerPoint! To me this was like the CEO of Ford Motor Company traveling to the Detroit Auto show on a motor scooter rather than their latest super looking, power dripping, hot Mustang. On top of that the choice of interviewer was wrong. Now, I like Ryan Seacrest on American Idol. My 12 year old daughter loves the show. He is clearly the number one TV show master of ceremonies, but he did not fit the part for an interview show at CES. They should have used Walt Mossberg, or David Pogue. It would have come off much less rehearsed and stiff. 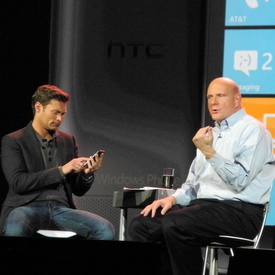 Steve Ballmer had the opportunity to do what Al Gore did for the cause of climate change, and Steve Jobs did for Apple at every keynote presentation with powerful, exciting visual supporting slides – got the audience engaged, excited, buzzing and motivated to take action with the peek into the future. In Gore’s case it motivated more people to be involved in the climate change issues, and in Steve’s case it motivated people to RUN out to buy Apple products. What better opportunity to promote a key Microsoft product by not just making a slide of bullet listed features (which might be all they know how to do), but use it in a way to show off how it can be an incredibly powerful communication tool! This entry was posted on Tuesday, January 17th, 2012 at 11:41 am	and is filed under General, Meetings, PowerPoint, Presentations, Technology.